DeMarcus Cousins made his long-awaited debut for the Golden State Warriors in Friday's 112-94 win over the Los Angeles Clippers, and the word "eventful" would be an understatement. It was Cousins' first game since Jan. 26, 2018, having spent nearly an entire year recovering from a ruptured left Achilles tendon. First, the stat line: 15 minutes, 14 points, six rebounds, three assists, one steal, one block ... six fouls. That's right, Cousins fouled out of his first game back in just 15 minutes. That's not entirely difficult to believe given the level of rust he was working with, but impressive nonetheless. "[The refs] was hating on me tonight, bro," Cousins said after the game. "I need to get used to this new NBA." Overall, however, the Warriors have to be encouraged by the big man's first game back. 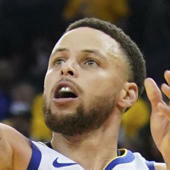 He showed a sweet shooting stroke (3-for-4 on 3-pointers), and appeared to fit well into the Warriors' read-and-react quick-hitter offense without requiring too many post-ups or isolations. Here are some of the best moments from Cousins' Warriors debut. After hitting the bottom of the backboard on an awkward reverse layup attempt to start the game, Cousins welcomed himself to the Golden State family with an emphatic dunk off of a bounce pass from Kevin Durant for his first points of the season. As good of a post scorer as Cousins is, what separates him from other big men is his ability to consistently knock down 3s. He showcased his feathery touch early in the second quarter, knocking down his first 3-pointer as a member of the Warriors. Just for good measure, he hit two more in the second half. Pelicans coach Alvin Gentry said on Wednesday that he thought Warriors fans would be surprised by how good Cousins' passing is, and he showed it off in his first game. Early in the third quarter, he caught the Clippers sleeping and hit Stephen Curry on a back-cut for an easy lay-in. Cousins only played in short bursts, but he displayed an ability and willingness to run the floor, and his teammates were happy to find him. Perhaps a product of his lack of conditioning, Cousins picked up fouls early and often on Friday. His sixth and final foul came with just under nine minutes left in the fourth quarter, after only 15 minutes of action. Fortunately, both the Staples Center crowd and his Warriors teammates gave him a standing ovation for his accomplishment. If you weren't sure about how happy the Warriors were to see Cousins back on the court, Curry and Klay Thompson showed you after the game. While Cousins was getting his postgame interview, they crept up behind him and showered him with a celebratory water bath. It was the perfect ending to a jubilant night for Golden State.